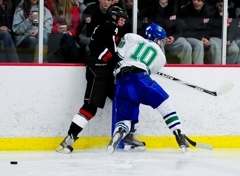 Last week, the MN Hockey Hub had covered every Class 2A Top Ten besides Eagan until their 4-0 win over Lakeville South on Dec. 16. 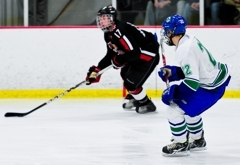 Two days later, a 2-1 loss to Lakeville North knocked the Wildcats out of the Top Ten and made them the underdogs going into the Dec. 22 game against Eden Prairie. 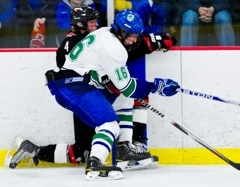 Michael Zajac had other plans as he stood by and backed up the warning he gave after the Wildcats' victory against Lakeville South to anybody or any team that overlooks Eagan. "We train harder than anyone and we have more fire than anyone, so just beware," Zajac said. 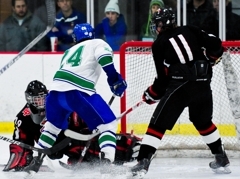 Eden Prairie became aware of that 'fire' as Eagan scored four goals that were unanswered until late in the third period. The Eagles got the game started with a quick shorthanded, breakaway goal by Luc Gerdes. It would be Eden Prairie's only lead of the game. Zajac answered quickly and with style. 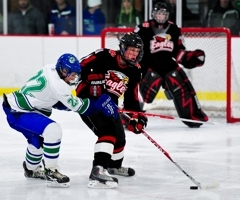 The junior co-captain picked up a lose puck behind the net, dangled his way through the Eden Prairie defense, then spun around and fired a quick wrist shot that found its way past Eagles' goaltender Andrew Ford to tie the game. "I made a nice move and put it on the net and hoped for the best," Zajac said. The best was yet to come as seconds later he would assist in Eagan jumping out to a 2-1 lead. After his shot bounced up and above Ford, linemate Nick Kuchera did his best 'Joe Mauer' impression and batted the puck into the back of the net. "I was pumped," Zajac said. "I just watched him 'celey' and then jumped on top of him. It put a big smile on my face and gave the team some confidence." It's possible Kuchera's goal may have been reviewed for high-sticking if it were a college or NHL game. The goal being overturned, however, was out of the question for Zajac. "No way," Zajac said. "Not at all." The Wildcats fed off the momentum from the first period goals and pounced on the Eagles in the physical match-up. "Our theme for the night was defense," said Michael Taylor, Eagan head coach. The theme seemed to work as Eden Prairie's star forward Kyle Rau was kept off the score sheet for the second consecutive game. 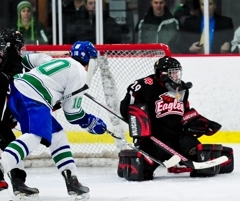 Eagan's defense was highlighted by goaltender Tommy Bodeker who made 34 saves in the win. "We really worked hard on defense and back-checking throughout the week," Bodeker said. "They're talented up front and have talented forwards so we were focused on defense." That tough defense led to several physical battles throughout the game - including one featuring Bodeker. During the second period, the senior co-captain caught a puck that was fired high on-goal as Gerdes crashed the net hard and made contact. Bodeker didn't hesitate answering the contact which led to coincidental minors on the Wildcats' goaltender (head contact) and Gerdes (slashing). "At the beginning of the game they took a couple whacks after I covered the puck," Bodeker said. "That one time I caught it and (Gerdes) kinda touched me so I gave him a little hit back. I dunno it's just what you expect when you play a team like that with traffic in front of the net. "My defense definitely took care of me and made it easy." Zajac had nothing but praise for his goaltender. "He's unbelievable," Zajac said. "He's a stud." 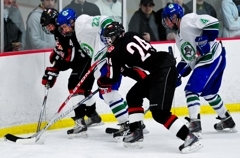 Another skirmish in-front of the net capped off an action-packed third period and gave Eden Prairie an added advantage with a power play and an empty net, but Bodeker would hold his ground and Eagan would skate away with the 4-2 victory. "Toward the end it was: play our system," Taylor said. "Play from the middle out. Take care of the middle first and then play out in the zone. I was probably screaming that when they pulled the goalie because you don't want guys jumping the sideboards. You gotta stay within the house and protect the house. "We don't ever focus on the scoreboard. We focus on our performance and the scoreboard will take care of itself." After upsetting the #2-ranked Eagles, the Wildcats are sure to be happy with their performance. 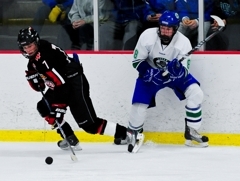 Both Eden Prairie and Eagan had tough games on Saturday, Dec. 18 as the teams lost their respective games that were decided by one goal. 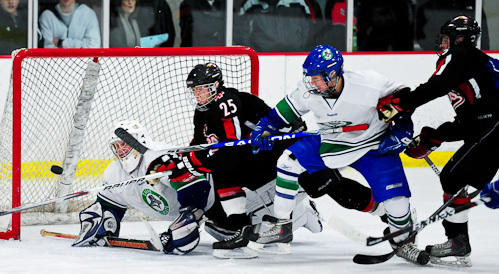 Eden Prairie lost in overtime to Edina 3-2 and Eagan fell to Lakeville North 2-1 running into a brick wall named Charlie Lindgren who made 54 saves against the Wildcats. 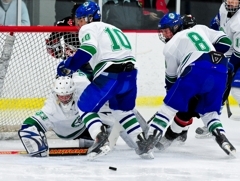 Although only letting in two goals against Lakeville North, Eagan goaltender Tommy Bodeker admitted the outcome was a difficult one to accept. "I kinda felt like I lost that one for us," Bodeker said. "Their goalie had a great game." 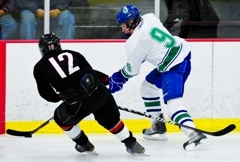 "(Lindgren) played his heart out," said Eagan's Michael Zajac. "It was his birthday and he's a great goalie. We used it as fire and put it behind us so we could come out strong." 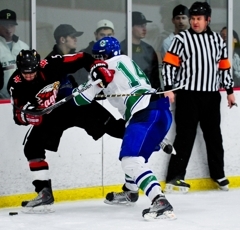 That tough loss seemed to provide strong motivation for the Wildcats to step their game up against Eden Prairie. 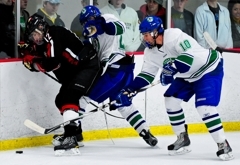 "When you look at our loss to Lakeville North, we had around 60 shots," said Michael Taylor, Eagan head coach. "It was one of those games. "I'm just proud of the kids that they didn't get down and they came in and competed tonight." His players shared that same mentality. "We didn't let the loss bother us for Eden Prairie because we knew if we didn't show up to play they would do the same exact thing," Zajac said. 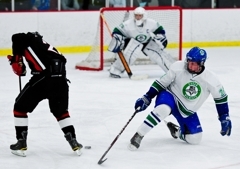 "We just put it behind us, worked hard in practice and got ready for Eden Prairie." Perhaps no one was more motivated than Bodeker to bounce back. "I felt like I owed these guys to come back and do the same kind of thing for them tonight." The senior goaltender did that and more making 34 saves and allowed his team to gain the treasured momentum. "We just had to rebound, keep our heads on straight and come out with intensity," Zajac said. 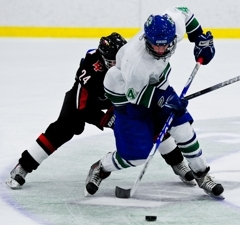 Eagan's Michael Zajac scored once and added twice assists in the Wildcats' 4-2 victory over Eden Prairie. The Eagles got off to a strong start thanks to a goal by Luc Gerdes on a shorthanded, breakaway opportunity. 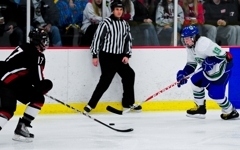 He brought the puck in, made a pretty move on Eagan's Tommy Bodeker and finished with a backhand as he continued his hot streak after scoring both goals for the Eagles in the game against Edina. Zajac quickly answered back with some fireworks of his own after some nifty puck handling and a quick shot past Eden Prairie's Andrew Ford. Less than a minute later, a shot by Zajac bounced up above Ford and Nick Kuchera skated by to bat the puck into the back of the net as the Wildcats jumped out to a 2-1 lead and never looked back. 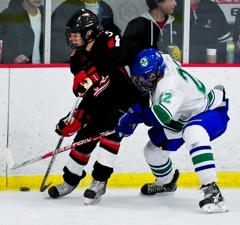 Will Merchant caught Eden Prairie off-guard and scored in the second period after Eagan killed one of the game's many penalties which set the tone for the rest of the period and the game. 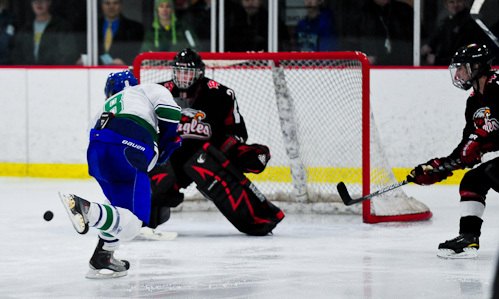 John Carroll would seal the game for Eagan in the third period. Gerdes would ease the bleeding for the Eagles providing his second goal of the game in the third period but it would be too little, too late. Ford finished with 14 saves for the Eagles. 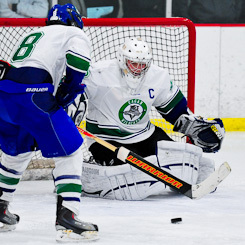 Eagan's Tommy Bodeker got the win recording 34 saves. 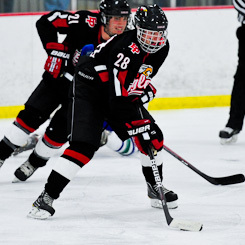 Eden Prairie's Kyle Rau was kept off the score sheet for the second consecutive game and the Eagles will work hard in preparation for their next game against Benilde-St. Margaret's on Tuesday, Dec. 28 at 2:30 p.m. at the St. Louis Park Recreation Center. 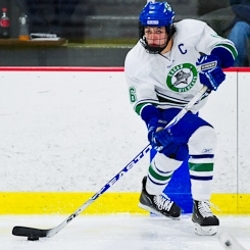 Eagan will face North St. Paul next on Monday, Dec. 27 at the Wakota Arena in St. Paul at 1 p.m.
Just over a minute after his team found themselves down 1-0, Zajac answered strong by scoring a pretty goal to tie the game. 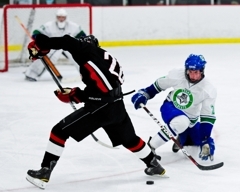 The junior co-captain picked up a lose puck behind the net, dangled his way through the Eden Prairie defense, then spun around and fired a quick wrist shot that found its way past Andrew Ford. 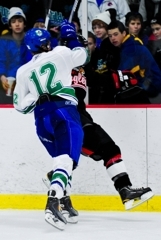 The goal obviously impressed the entire crowd at Eagan Ice Arena as the reaction was quite audible. Zajac would then register assists on the Wildcats' next two goals. 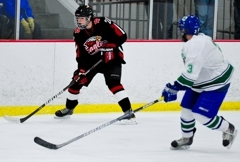 The senior co-captain faced an Eden Prairie team that was averaging 36 shots on goal and 6.5 goals per game. Bodeker (pictured above) saw the 36 shots, but only allowed two goals. The 34 save performance was masterful and impressive as Bodeker puzzled the powerful Eden Prairie offense and kept Kyle Rau off the score sheet. 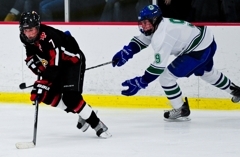 Gerdes (pictured below) has scored twice in each of Eden Prairie's last two games. His efforts, however, have not provided any victories. 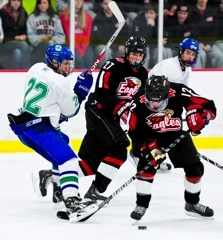 The senior forward's shorthanded, breakaway goal was picturesque and his third period goal stopped the bleeding for the Eagles by cutting Eagan's lead to two goals. Unfortunately, Gerdes found himself alone in the scorer's column for the second consecutive game.